Below is a photograph of my printed copies along with an ancient yellow ruler that somehow escaped being broken over the decades. As you can see, the height is just over 1/2 of an inch or 14 mm. The letter size might vary a little from person to person- or to be more precise, from printer to printer. The animations are un-intimidating and hand-drawn. 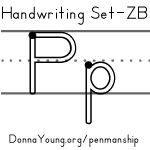 While both lowercase and uppercase letter p can be drawn without a pencil lift, many times, uppercase P is taught using one pencil lift or with two strokes. Animations are included for both variations of uppercase P.
Attendance H - an attendance calendar that can be used for several children.